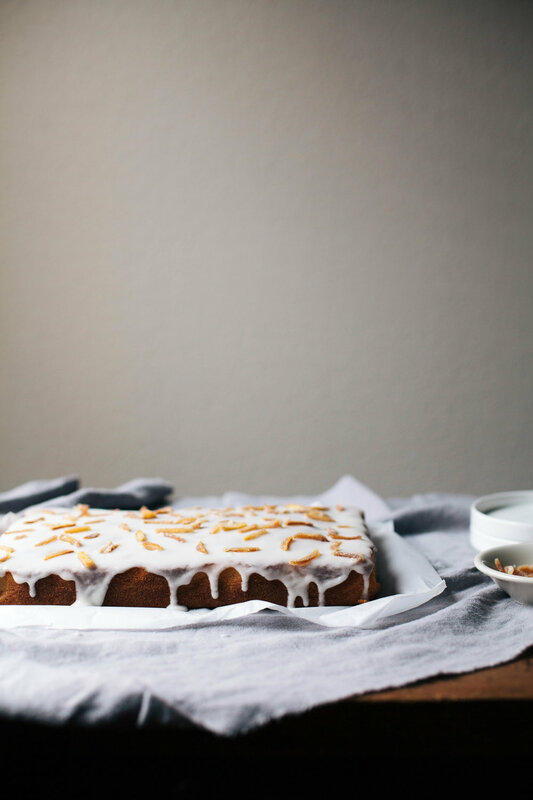 Lemon Cake with Coconut Icing — always with butter. Oven 350F. 9x13 pan, buttered and lined with parchment. In a large bowl, whisk the flour, baking powder, baking soda and salt. Set aside. In the bowl of stand mixer fitted with the whisk attachment, cream the butter, sugar and lemon zest together until very light and fluffy, 3-4 minutes. With mixer running, add in the eggs and yolks one by one until fully incorporated. Add the lemon juice. In alternating batches, add in the dry mix and buttermilk, about 1/3 at a time. Ending with the dry mix. Pour into prepared pan and bake for 30-35 minutes, until top is lightly golden and springs back to the touch. Remove from pan, brush with the candying syrup and let cool completely. While the cake is baking, make the candied peel. With a sharp knife, cut the peels away from the flesh. Then cut the strips of peel into little pieces. Add the sugar, lemon juice and peels to a pot. Bring to a boil over high heat, then reduce heat to medium to just simmer. Let cool for about 20-25 minutes until the white pith of the lemon peel becomes translucent. Strain out the peels, reserving the liquid. 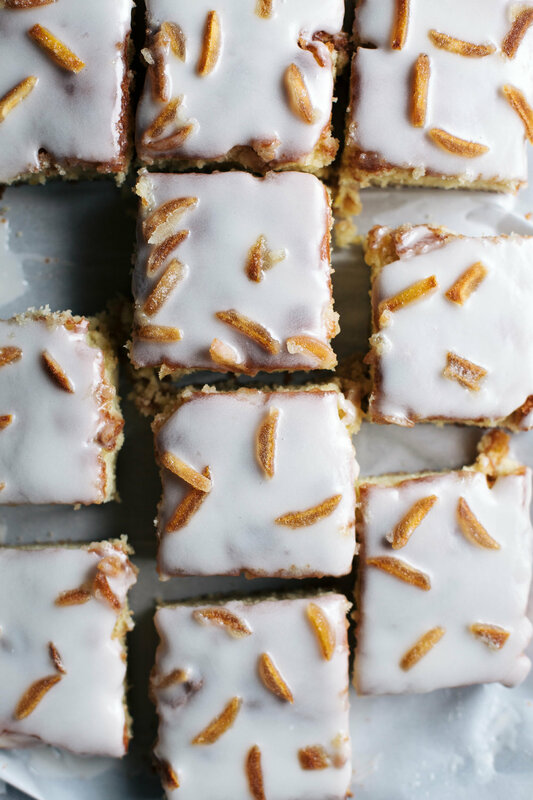 Place the peels on a parchment lined baking sheet. When you remove the cake from the oven and turn off the oven, place the sheet of peels in. Leave in oven for about 10 minutes, until the peels are dry. Then toss in a bit of sugar and set aside. Whisk together until smooth. Pour over cooled cake and top with candied peels.